The seminal rap group A Tribe Called Quest brought jazz into the genre, resurrecting timeless rhythms to create masterpieces. This narrative follows Tribe from their early days as part of the Afrocentric rap collective known as the Native Tongues, through their first three classic albums, to their eventual breakup and long hiatus. Their work is placed in the context of the broader rap landscape of the 1990s, one upended by sampling laws that forced a reinvention in production methods, the East Coast-West Coast rivalry that threatened to destroy the genre, and some record labels' shift from focusing on groups to individual MCs. 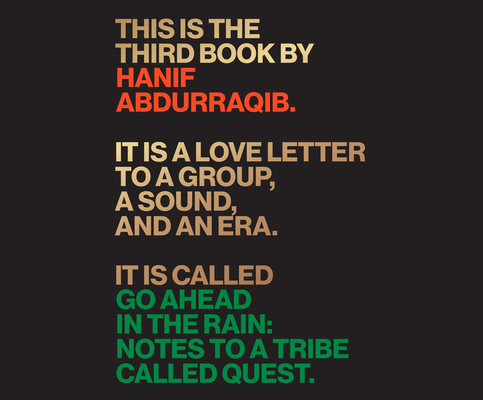 Throughout the narrative, poet and essayist Hanif Abdurraqib connects the music and cultural history to their street-level impact. Whether he's remembering The Source magazine cover announcing the Tribe's 1998 breakup or writing personal letters to the group after bandmate Phife Dawg's death, Abdurraqib seeks the deeper truths of A Tribe Called Quest, truths that--like the low end, the bass--are not simply heard in the head but are felt in the chest. Digging into the group's history, Abdurraqib draws from his own experience to reflect on how its distinctive sound resonated among fans like himself. The result is as ambitious and genre-bending as the rap group itself.